Bandar Sungai Long, 43000 Kajang, Selangor. *For Actuarial Challenge, contact William Siaw Wei Liang (+6017-916 3981) for more information. *Only valid for the first 30 registrants and before 31st March 2018. *One representative is required to pay the total amount for five persons. Online registration starts on 18th January 2018. Closing date: 15th May 2018 for Actuarial Conference and 30th April 2018 for Actuarial Challenge. Cash deposit method payable to 'Universiti Tunku Abdul Rahman' with account no. 3118325015. Complete pay-in slip recipient reference 'AT2018' when making payment to the teller. Log on to www.pbebank.com.my, a service provided by Public Bank Berhad to their current and savings account holders, for instruction and payment. Cash transfer to 'Universiti Tunku Abdul Rahman' with account no. 3118325015 and recipient reference 'AT2018'. This service is accessible daily from 6.00am to 12.00 midnight. A service fee will be charged by the Bank for each successful transaction. You are advised to print for your record the 6-digit reference number shown on the confirmation page as receipt reference for successful execution of the internet banking service. Cash payment to the organizing committee at the booth. Receipt will be issued on the spot. ** Payments are to be done within 10 days after registration form has been submitted for Actuarial Conference. Or drop us an email at actuarytoday@utar.edu.my for any enquiries. Any changes made to the competition will be announced in our Facebook Page “Actuary Today” and official website www.actuarytoday.com. To illustrate the role of actuaries in insurance. To provide the information on current actuarial employment outlook in Malaysia. To introduce alternative career paths for actuarial science students. To provide a platform for high school and foundation students to understand Actuarial Science course. To provide a platform of interaction among public, actuarial science degree holders and external paper professional bodies. To equip actuarial science students well with sufficient knowledge and skills so that they are able to enter working field without facing much difficulties. To improve the quality and competitiveness of actuarial science degree holders in the employer market. To provide a platform of communication among actuarial science degree holders in Malaysia. To provide information relating employer companies to the public and actuarial science degree holders. To build up the interest in actuarial science among younger generations. To promote the standing of the actuarial profession in Malaysia, and rise the public esteem of the profession. An actuarialcompetition that simulates a real actuarial working environment where the participating teams must complete on the assigned assignment (e.g. pricing insurance product) within a limited time framed. Opens to full-time undergraduate students of the participating educational institutions (public and private) who are pursuing actuarial or related courses. Master's degree program and PhD students are not eligible to participate in the competition. Each educational institution is only allowed to send ONE team of 6 full-time students to compete in the Actuarial Challenge and each team has to include at least 2 Actuarial Science final year students. 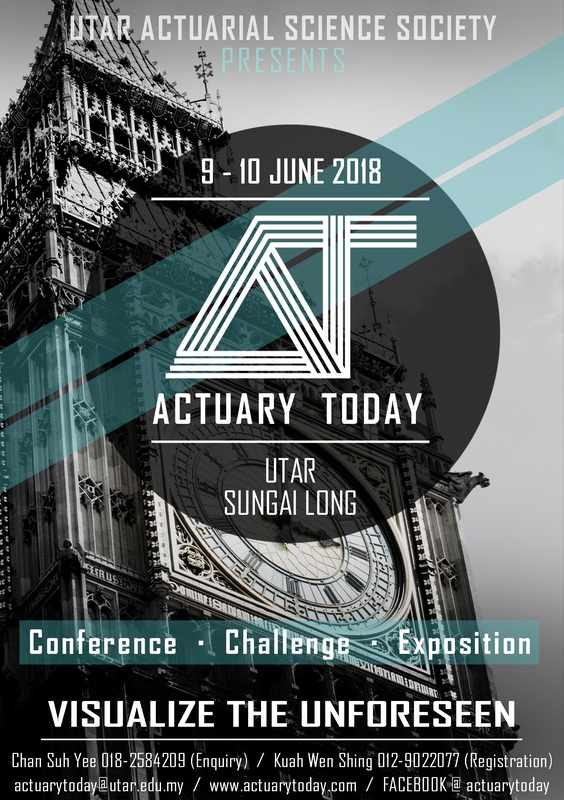 An actuarial symposium that exposes participants the brief ideas of actuarial science course and provides the insight of the working environment of an actuary in the future. The conference comprised of actuarial talks, programming workshops, and town hall meeting. Opens to high school, pre-university, and undergraduate students. An actuarial-related exhibition that provides opportunity to participants in introducing and enhancing their actuarial science knowledge, and exposing them the actuarial professions. The exposition contents consist of development of actuarial science, basics of actuarial science, job prospects and diversification of an actuary, introduction of actuarial professional exams and institutions, actuarial pathway. Having actuarial profession institution showcases and actuarial simulation games. Opens to high school, pre-university, undergraduate students and publics. Each team will be provided with related information on the case via email one week before the Actuarial Challenge. All teams may start to gather the information they need before the actual day. All teams may obtain data from any sources they could reach. On 9th June 2018, each team will be given the assignment to work on. The scope of assignment will be related to the information given one week ago. Each team has to complete the assignment within 24 hours. All teams are open to use any type of software in their assignment. All teams can seek for the actuaries’ advice related to their assignment during the consultation time. On 10th June 2018 all teams are required to prepare a one-page executive summary for presentation. There is no need to prepare the presentation slide and report. Each team has to present their model to the Panel of Judges.